One of the finest wee drams in lodging! An exclusive rural whisky retreat with magnificent views across Speyside, the Conval Hills and Ben Rinnes. Aberlour just 10 minutes drive. This is the hotel of choice for the Single Malt Whisky lover. Located in the grounds of Cardhu distillery some 9 miles west of Aberlour and Craigellachie, Cardhu Country House has served as a base for Speyside Whisky Trail for years. Winner of the 'Best guesthouse/b&b' in the 2012 Highlands Awards, the hotel offers six beautifully appointed guest rooms. All rooms have tea/coffee facilities and an en suite bathroom with soft, luxury bathrobes. 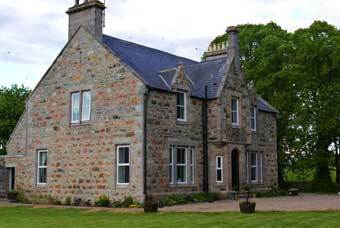 The Cardhu Country House is enclosed in several acres of leafy, landscaped gardens only a mile from the River Spey, famous for its fine fly fishing and its salmon. The Speyside Way is a particular treat for ramblers and cyclists. This is a long distance riverside route which links the Cairngorm Mountains to the Moray Coast.